Londonist Out Loud is presented and produced by N Quentin Woolf. Today he takes a journey on the Thames with guest Sean Collins, who is CEO of Thames Clippers. Hear about how Thames Clippers has grown from a one-boat commuter service 15 years ago to a fleet of 13 boats now. Which other method of transport are you legally guaranteed a seat on, even during rush hour? If that doesn't sell the idea to you, we don't know what will. 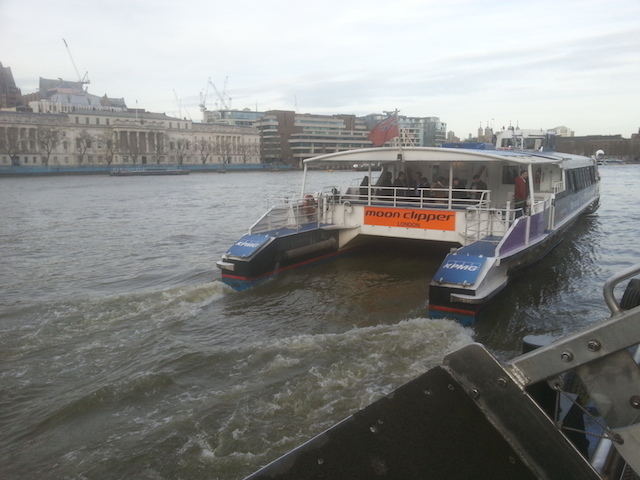 Could the Thames grow to carry 15 million passengers a year with the right infrastructure improvement? Plus, find out why Sean thinks that the Thames cable car could be a major part of the London transport network in the future. You might also like our previous articles: Roaming the River with Thames Clippers and a video of A Day in the Life of a Thames Clippers Crew. Londonist is proud media partner to Thames Clippers – the fastest and most frequent fleet on the River Thames.